Hi loves! Aaah, it has finally cooled down a bit here in our little country. I love summer but temperatures over 30° Celcius are just too much. I can't function with that heat! Well, last night I finally felt like doing some art again and the beautiful summer colors from the Cirque Colors Vice collection called out to me. The basecolor is Miami-Dade from the Cirque Colors Vice collection (releasing today!). Full swatches are coming soon but I'm just head over heels in love with this shade. It's the second time I've put it on my tips and it's on my toes as well - I rarely wear anything other than red on my little piggies! There is something about this bright blue that makes me so happy. It's a pure, cyan blue, no green tinge at all, and while it's bright it also feels clean to me. Just a perfect summer blue I guess! After it dried I used my Dance Legend Pure Manicure cuticle protector and grabbed my Born Pretty Store BP-L008 plate and double-stamped the same image using Konad White and Cirque Colors Memento Mori. Doesn't the image look gorgeous against that blue? Yeah, I admit, I'm obsessed ^^. It's just SO PRETTY! While writing this post it's still on my tips and it's staying there for at least 1 more day, maybe 2 if it behaves ;-). What do you think of this look? Something you'd wear? And what's your favorite cyan blue? Cirque Colors is sold through their own website. The Cirque Colors Vice Collection retails for $13 per bottle, worldwide shipping available. There are also various stockists selling Cirque polishes so be sure to check if you can shop more locally, too. Love this! Miami-Dade is such a gorgeous blue! I love this image, and once again you have made double stamping look phenomenal! Super cute with the black and white dubble stamping! Well give me some of the heat please!! Lol, Sweden is all rainy and windy uuh!! Do you happen to know if this is LE (so I will have to forgo on buying groceries and stuff to make sure I get this beauty the moment it shows up in a store near me)? Me want!! I swear a gorgeous color turns me into a cave woman. The double stamping is so crisp too! I envy your stamping skills. Glad you like it Joyce! This set is LE so you might want to grab them quickly. Heck yeah! 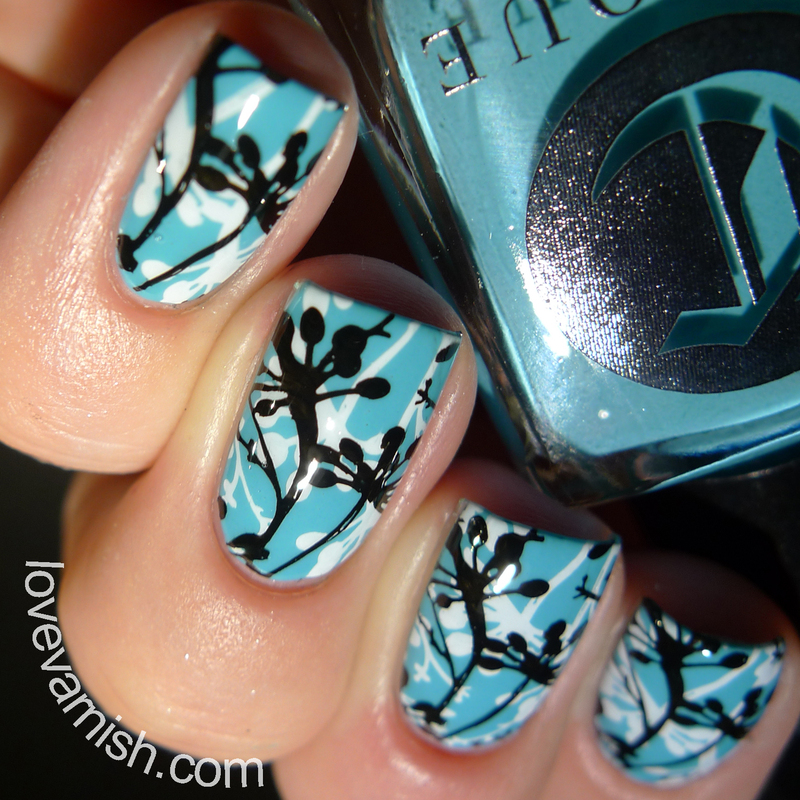 This double stamping totally rocks, I love it! I used to have a very old Essence that looked a lot like this Cirque and I loved the colour. Unfortunately the formula was a nightmare and I ended up never using it again. Oh awesome! You always choose the most striking colour combos! 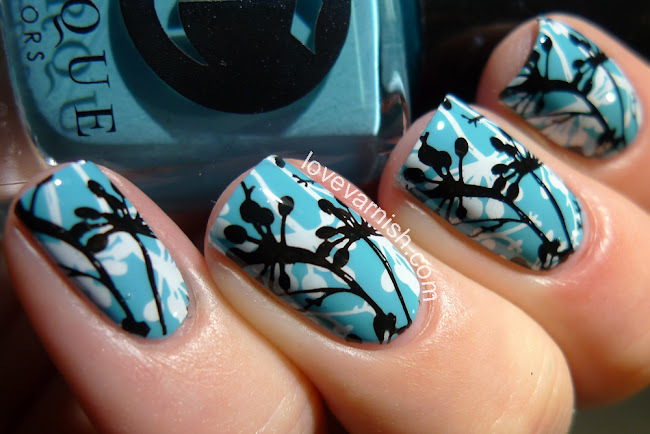 Manis like this are why you are my stamping idol! Beautiful color selection and composition. This looks like a gorgeous vintage print. As always, your double stampings never cease to be flawless! Love this SO HARD! Super gorgeous!! So much perfect in one post! It most certainly is! Might be my favorite EVER! Thanks so much Kerry! I really enjoy this technique a lot. I would have gladly split the heat with you, it was just TOO MUCH lol! And thanks Bella <3. Grab that bottle by its hair and drag it to your cave then :D! Thanks ♥. Thank you Allie! I always love how it adds so much more depth to the look. Lol, yeah that name is quite imaginative.. NOT :P.
Please do :D! Not literally though ;-). Thank you so much Simona! Ugh, one of the old Colour & Go shades? I threw them all out except a few in the newer bottle, they were impossible to mix and I never ever used them anymore. Thanks Katherine, that's really sweet! O.O you are too kind! This is actually the easiest technique EVER lol, nothing difficult about it. Thanks for your kind words <3.